Law enforcement's use of confidential informants is being criticized as a tactic that sends young and vulnerable individuals to do high-risk police work on the cheap. Confidential informant programs at the local, state and federal levels are shrouded in secrecy and, in some cases, operate with little regulation and oversight. In a case featured in the Inlander, a 19-year-old from Coeur d'Alene died of a gunshot wound to the head 11 days after he started working as an informant for the Idaho State Police. The coroner has ruled the death a suicide, but the Coeur d'Alene Police investigation is still ongoing. A recent report from the U.S. Department of Justice found that the DEA paid $9.4 million to "deactivated" confidential sources between 2011 and 2015. The report also found that the DEA kept more than 18,000 confidential sources between October 2010 and September 2015 — 9,000 of those sources received about $237 million during that time. "We found that the DEA did not adequately oversee payments to its sources, which exposes the DEA to an unacceptably increased potential for fraud, waste and abuse, particularly given the frequency with which DEA offices utilize and pay confidential sources," the Justice Department report reads. There were no records of whether or not the hundreds of millions of dollars resulted in convictions or drug seizures, according to the inspector general's testimony to the Congressional House Committee on Oversight and Government Reform in November. Beyond the lax oversight at the federal level, confidential informant programs in state and local departments present several problems for the citizens recruited to do perilous undercover police work as well as those they set up. The inherently secretive policies often sidestep the public and transparent justice system. Those issues are laid out in the book Snitching: Criminal Informants and the Erosion of American Justice by Alexandra Natapoff, a law professor at Loyola School of Law in Los Angeles and a leading expert on confidential informants. Natapoff points to issues with the credibility of jailhouse snitches and the disclosure of any benefit the informant receives in exchange for their testimony. The U.S. Supreme Court has ruled that defendants' constitutional rights can be excused in the name of withholding a confidential source's identity (although there can be legit reasons for withholding a CI's identity). Not to mention, the questionable circumstances under which informants are typically recruited. Natapoff and Lance Block, an attorney in Tallahassee, Florida, helped write and push forward one of the first state laws regulating the use of informants. Block represented the family of 23-year-old Floridian named Rachel Hoffman, whom police sent to buy two-and-a-half ounces of cocaine, 1,500 Ecstasy pills and a pistol, according to an expose´ in the New Yorker. Police lost track of Hoffman during the drug sting, and her body was found days later, riddled with bullets from the gun police told her to buy. "They operate in the shadows with no checks and balances. It's not about eliminating this practice; it's about installing some limits." The Florida law requires agencies to develop policies for the use of informants, requires officers to complete specialized training, and establishes a list of criteria for police to consider in determining a person's fitness for the high-risk work. A person's age, substance abuse history, criminal history and mental and emotional wellbeing are among some factors for police to consider, though the law still allows wide discretion. It's a start, Block says, but the law doesn't go far enough. And while the internal policies of some law enforcement agencies put limits on who can be used as an informant, other agencies have no such restrictions, and some, such as the Kootenai County Sheriff's Office, don't even have an official policy on the books, according to its response to the Inlander's public disclosure request. "There are no regulations, no uniform standards, so every law enforcement agency is flying by the seat of their pants," Block says. "Not even every police officer is qualified to work undercover. Yet we're using 18-, 19-year-old kids." Block and Natapoff continue to push for reforms. Natapoff advocates for more data that will give the public a clearer picture of who police are using as informants and how: age, gender, zip code, and the specific cases informants help make, for starters, she says. "If we require these CI programs to behave like any other public policy, and hold them accountable in very standard ways, I think the culture would change," she says. "Police and prosecutors would no longer be operating in the shadows, and they would have to justify their decisions." • Require police to tell potential informants of their right to talk with a lawyer. "CIs are vulnerable to harm when they are 'flipped' and then immediately sent out to do a deal because there has been no screening of a recruit or planning by [law enforcement] to work with the CI in that given situation," Block writes. • Place the safety of informants as the "highest priority." • Minors should not be allowed to work as informants. Block cites a case near Los Angeles from the 1990s where a 17-year-old police informant was tortured and killed. Chad MacDonald's death inspired a state law restricting the use of minors as informants. • Require police to notify the informant's family when he or she is in danger or has been killed. In the case of Isaiah Wall, the 19-year-old North Idaho informant, neither the Idaho State Police, nor the Coeur d'Alene Police told his mother, Courtney McKinnie of his work as a CI. And ISP would neither confirm nor deny that Wall worked for them, citing a provision in Idaho law that protects the identity of confidential police sources. 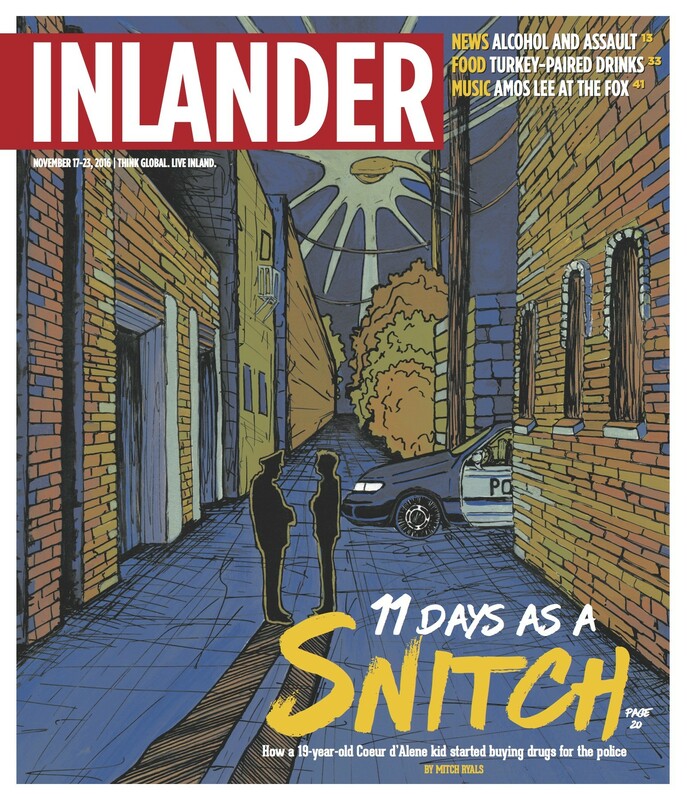 "They operate in the shadows with no checks and balances," Block tells the Inlander. "It's not about eliminating this practice; it's about installing some limits." This year the Washington state legislature considered bills that would have required judges to verify the truthfulness of informants before their testimony is heard by a jury. Neither bill made it out of committee. For Richard Wall, a Spokane-based criminal defense attorney, informants' credibility is a huge problem. Often, jailhouse informants can shave time off their own sentence by testifying against someone else. "There needs to be serious changes in the law," he says. "If all you've got is a CI giving testimony that's not supported by anything else, there needs to be some corroborating evidence before that testimony is heard in court." Indeed, jailhouse informant testimony has repeatedly been shown to be unreliable and often results in wrongful convictions. In 2013, the state Senate considered a bill with similar parameters as Florida's Rachel's Law, with no success. The bill was inspired by a case in southwest Washington. Jeremy McLean, 26, worked as an informant for the Cowlitz Wahkiakum Narcotics Task Force. He was shot and killed months after he set-up a heroin dealer named William Vance Reagan, who was out on bond. McLean's body was found in the Columbia River on New Year's Eve 2008. No recent bills in the Idaho legislature have addressed the use of informants; however one veteran Kootenai County public defender calls the practice "distasteful to say the least." For Brad Chapman, who has worked more than 20 years as a defense attorney in North Idaho, using confidential informants to make drug cases is counter intuitive to the war on drugs. "The only way to take people out of that lifestyle is to take them out of that lifestyle," he says. "Sending a young kid back into that situation is certainly not going to help him, and it very rarely does legally. It's a sad goddam business." Adds Natapoff: "Given the reality that informant deals are baked in [to the justice system], we are obliged to better regulate it. And we have fallen down in that regard. We have given such broad discretion to police and prosecutors and failed to create transparency and accountability mechanisms that would give us confidence these deals are made in responsible ways."